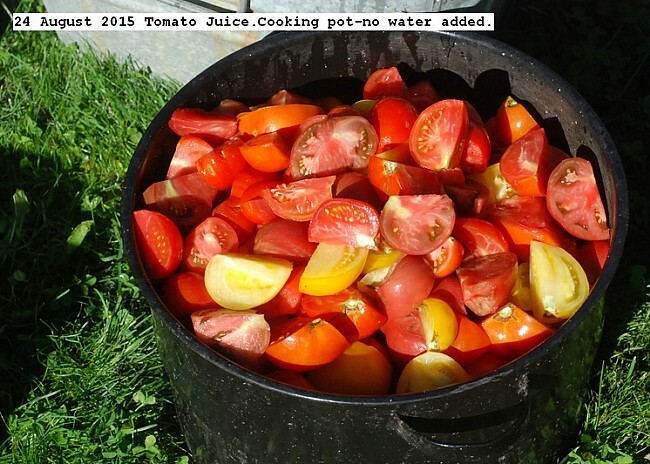 Forty pounds of tomatoes were made into 14 liters of juice. No water was added.Some available basil, egg plant and sweet pepper was used.Tomatoes were washed, quartered, cooked until soft, hand blended into a slurry, strained, then pressure canned at 15 PSI for 15 minutes.Pictures depict the process. This entry was posted in Uncategorized and tagged 24 August 2015 Tomato Juice, Tomato Juice. Bookmark the permalink.